Britain’s Royal Mint is owned by the British government, and was established by the Queen in 1968. The mint is headquartered in Llantrisant, South Wales, and is known as the leading export mint in the world. The Royal Mint produces coins and medal for more than 60 countries each year, but the mint’s first allegiance is to mint coins for the citizens and banks of the United Kingdom. There is much history throughout Britain and one of the iconic representations of Britain is the Britannia. Britannia has been loved by Queen Elizabeth II and this graceful representative of strength and victory is depicted standing on rocks along the sea, flowing rode tossed by the wind. Britannia was first featured on gold bullion coins in 1987 after a long absence. She originally adorned British coinage for close to 300 years, and was pictured seated on rocks with a ship behind her. The newly minted coins were released in October 1987 and were the first to feature the new standing figure of Britannia. Sculptor and artist Philip Nathan designed the new Britannia and chose to have her standing to symbolize strength and purity. Her left hand holds the olive branch that represents peace, while she dons the British shield and a trident, ready for battle. The Roman ancestry is illustrated by Britannia’s helmet and elongated visor complete with a plume. The rocks she stands upon are along the sea—the love of Britain along with their prided Naval force. Britannia exhibits strength, power, grace, and dignity. In 1997, the British Silver Britannia bullion coins were first minted at the Royal Mint, and the silver used to strike these bullion coins has a higher purity than sterling silver, containing a full ounce of pure silver. These illustrious silver bullion coins are minted as proofs and bullion with complementing finishes. They remain the most popular coins produced by the Royal Mint. The British Silver Britannia bullion coins contain one troy ounce of silver and the face value is £2, which is equal to approximately $3.00 of United States currency. These highly regarded silver bullion coins are also available as a set that comes with four coins: 1/10 oz, ¼ oz, ½ oz, and 1 oz. The sets are contained in a beautiful case and come with a certificate of authenticity. 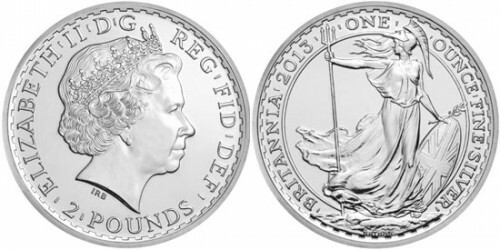 The 2013 British Silver Britannia was changed to a 99.9% pure silver content from the 95.8% silver used since its inception, aligning the Silver Britannia with other modern silver bullion coins.